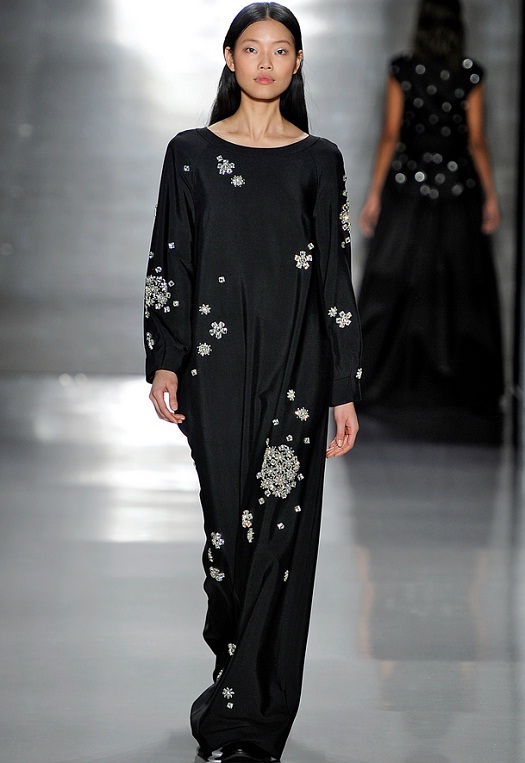 Quite in tune with the New York spirit but also standing out from what has generally been trending on the NYFW catwalks, the Noon by Noor FW15 collection confirms the assumption that ultra-talented Bahraini designers Shaikha Noor Al Khalifa and Shaikha Haya Al Khalifa are creatively more confident and mature than ever before. They sent down the runway at Lincoln Center a charming mix of futuristic and retro, darkness and opulence, haute luxury and hipster attitude. 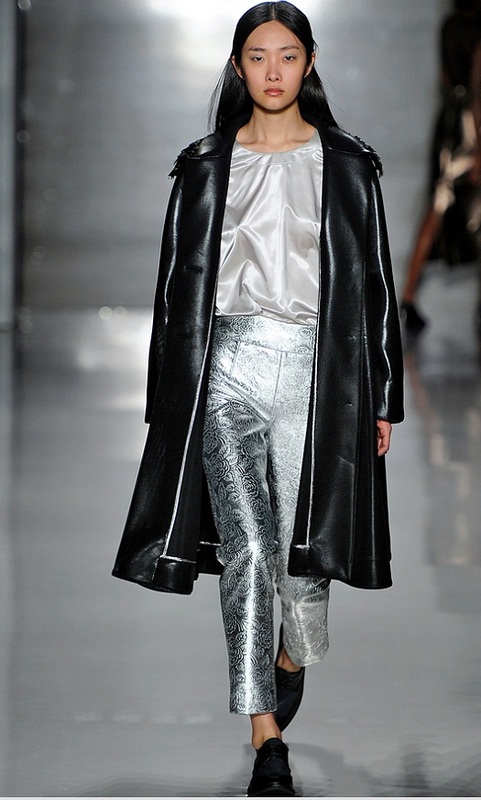 Black, silver and other metallics dominated the picture along with leather, brocades, foiled wool, and tech fabrics on a variety of youthful and flattering-to-all silhouettes. The palette included a few other colors; navy blue, purple, and white. 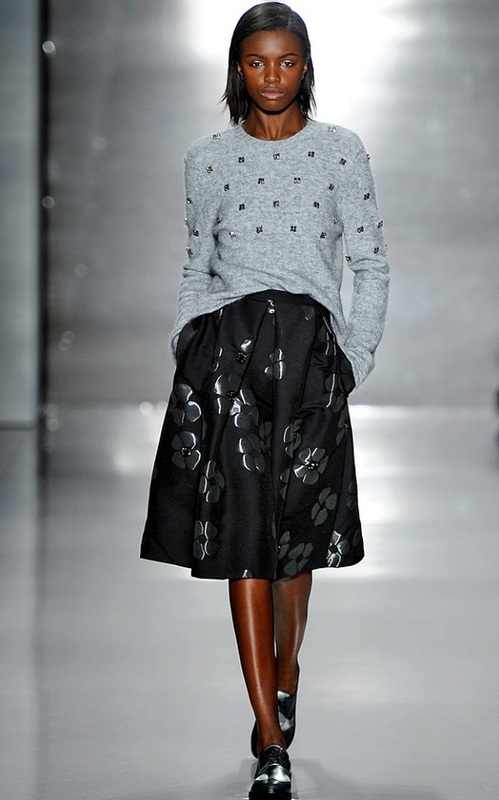 There where mid-calf pencil skirts, but also minis and fuller ones at various lengths. 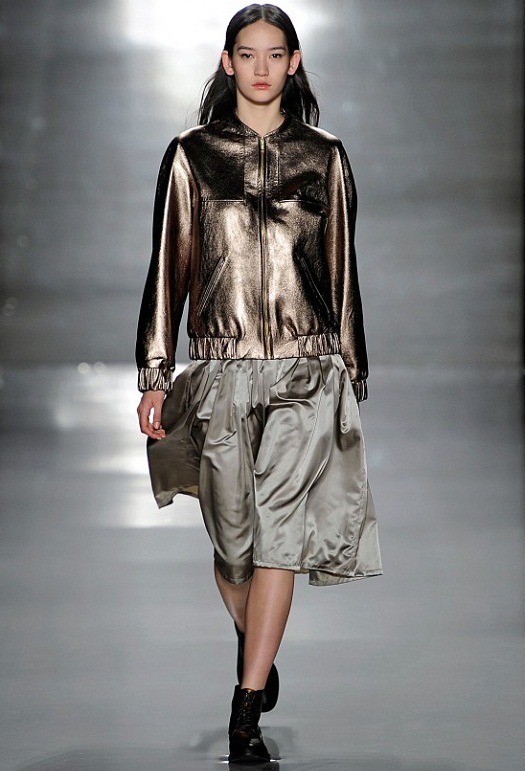 Sprinkled with menswear/sporty elements, the collection featured a gracious bronze bomber jacket, cropped skinny pants, t-shirt-shaped tops, and tech grid shirt-dresses. 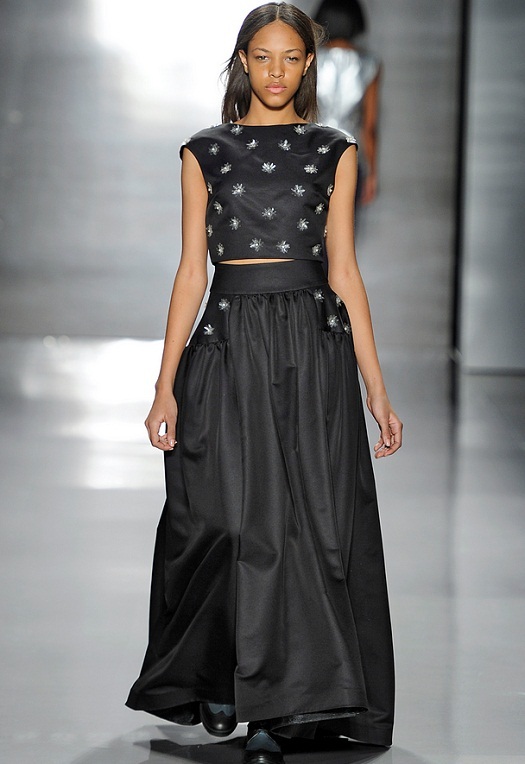 Eveningwear featured also fashionable black-tie alternatives such as a cropped top with matching high-waist maxi full skirt, a roomy crystal-embellished long ‘caftan’, and some space-age gowns. 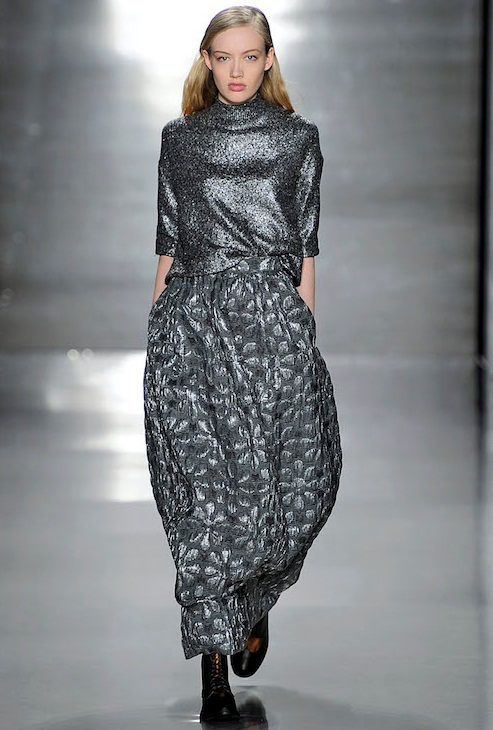 Darkness juxtaposed with different types of sparkle and shine such as in the texture of some tech fabrics, the various glam floral embellishments, the metallic leathers, and the foiled brocades. Models were sporting flat shoes even with eveningwear; mostly brogues and booties. This cool aesthetic was transcending the whole collection, including some eye-catching outerwear pieces. 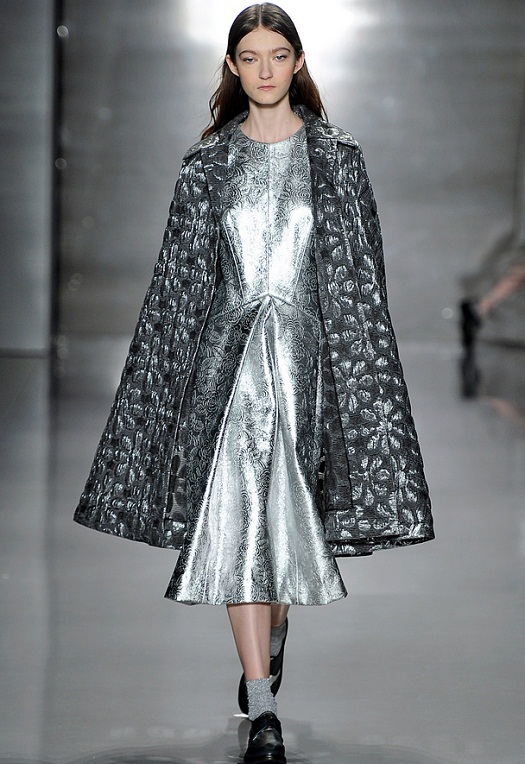 The cape coats were stunningly layered over dresses and other ensembles, and in general the roomy silhouettes oozed great confidence. 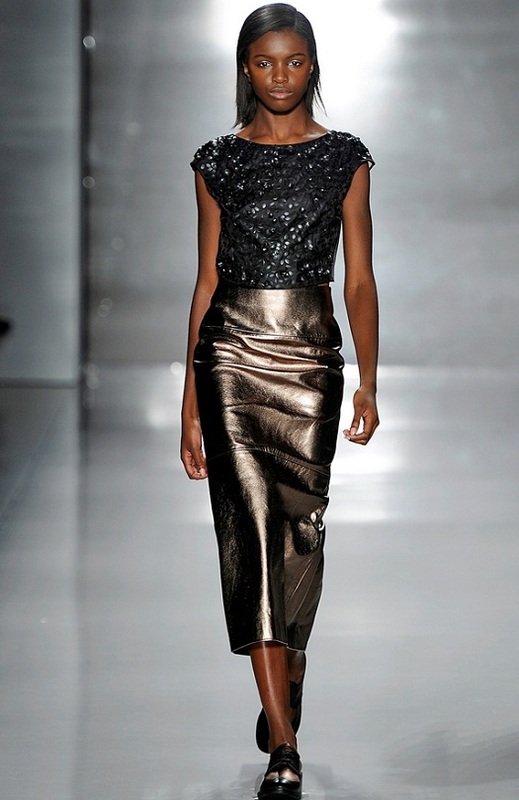 The looks were polished and chic with strategically chosen edgy elements. Minimalism and clean-cut lines were spiced up with decently used luxe adornments. You could see the 60’s somewhere in the shapes, but you could also see the 80’s and the 90’s along with the future! The designers have a faithful celebrity clientele who really appreciate their unique approach, especially for their red carpet appearances. Front-row at the show some gorgeous ladies were proudly wearing Noon by Noor styles; Coco Rocha a Pre-Fall 2015 Drew top, Haiden pants, and Dylan jacket, Olivia Palermo a Pre-Fall 2015 Jamie top, and Leigh Lezark a Pre-Fall 2015 Dylan jacket and Riley pants. In attendance were famous bloggers too; Marianna Hewitt of La La Mer, Kat Tanita of With Love from Kat, Mary Seng of Happily Grey, Rachel Schwartzmann of The Style Line, and Erin Framel of The Glamourai. 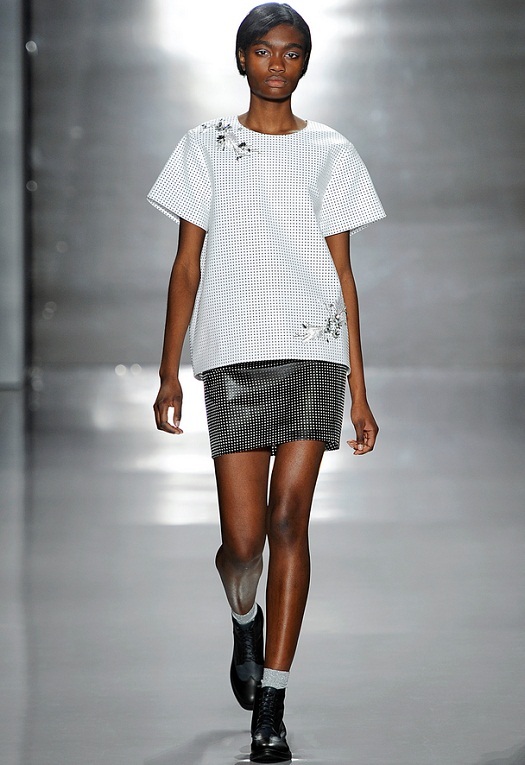 The glam and techy vibes were mesmerizing and personally I would wear every single piece from the collection. I think that they made a difference, and this is what every fashionista is craving for right now! Skingraft: Cool Stripes and Black!